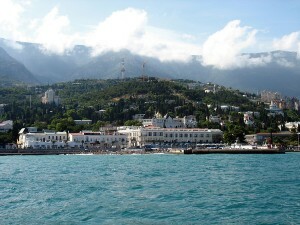 Yalta («Coast») stretches along the coast of a sea bay on the slope of the Main Ridge of the Crimean Mountains. 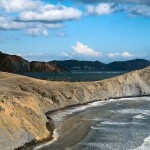 In ancient times the Greek settlement of Jalita existed on this territory. In the Middle Ages there was the Byzantine and Genoese settlement, they named it as Kaulita. 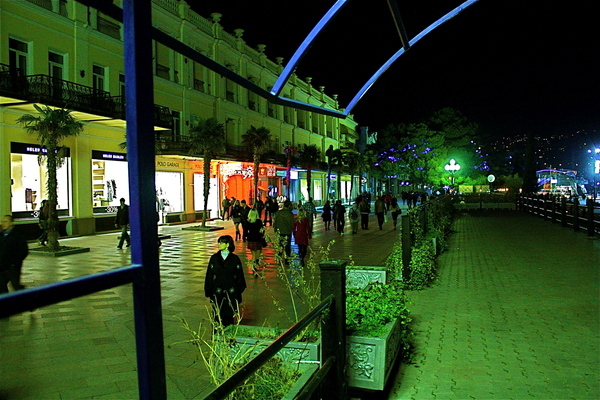 In 1837 it was turned into a district city which began to be developed according to the 1843 plan. 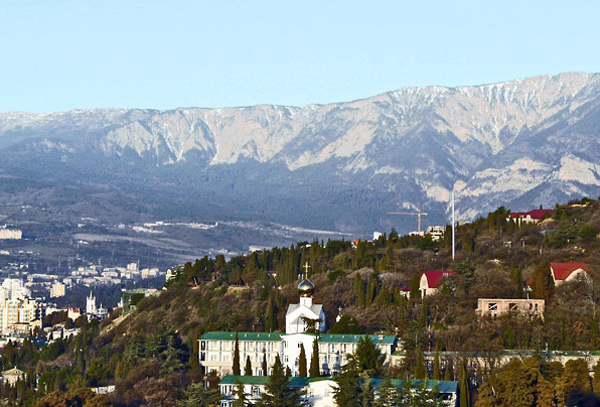 At the end of the 19th century Yalta has a rapid growth, and the development of valleys of the Derekoika and the Uchan-Su Rivers. 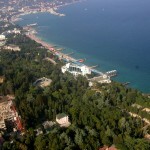 Now it is a significant resort and cultural centre whose boundaries widened thanks to multistory housing developments on the adjoining slopes. 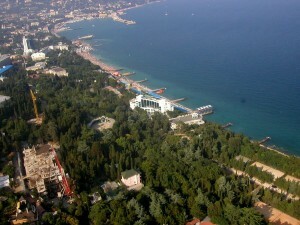 The city territory incorporates land from the mount Ayu-dag to the Sarych Cape. 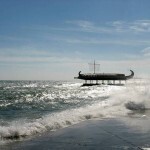 Greater Yalta is a 70-km stretch of the South Crimean coast washed by the Black Sea. 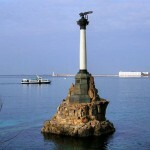 The mount Ayu-dag (“Mount Bear”) is a kind of signpost to Greater Yalta. 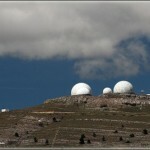 Farther on the highway goes past Gurzuf, the Nikita Botanical Gardens and Massandra. 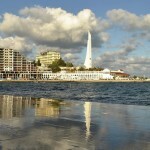 The resorts and sights of interest located to the west are Livadia, Oreanda, Gaspra, Koreiz, Miskhor, Alupka and Simeiz. 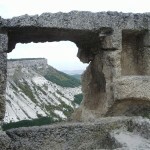 A snow-white city lies inside the enormous shell formed by a semicircle of mountains. Yalta is beautiful in her mountain setting, she is open only to the sea and the sun. The cypresses with cones like little bells have already become a symbol of the resort. Magnificent magnolia trees fill the air with their perfume… And the sea adds the finishing touch to all this beauty. 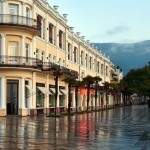 Once you arrive in Yalta you will fall in love with it! 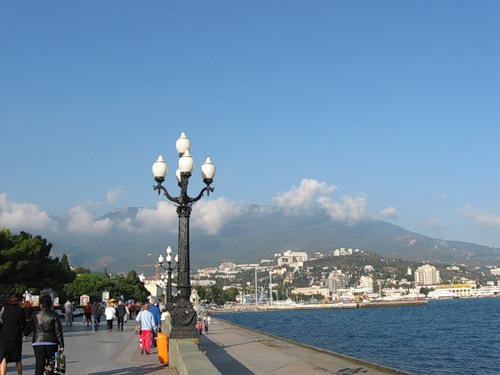 We suggest you begin your walking tour of Yalta with an itinerary that might be called Along the City’s Streets, that is from the Yalta Hotel to the Oreanda. 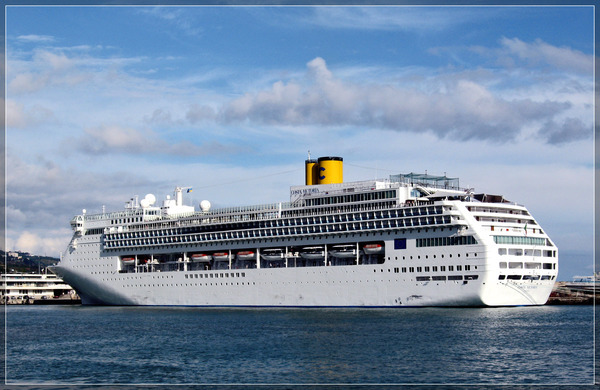 Its length is about 3 kilometers. 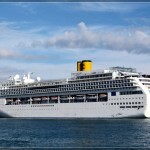 Hotel to the port. 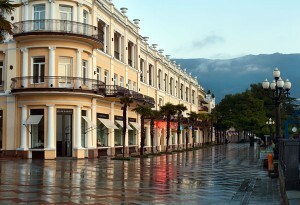 At the intersection of streets stands Primorskiy Hotel (“Sea-coast Hotel”), one of the oldest in Yalta. 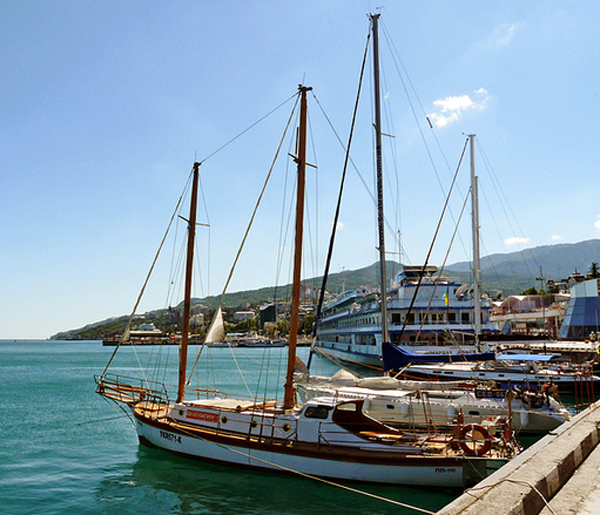 From here you can walk down to the port, in the other direction a small street leads uphill from the Hotel to Polikur Hill. 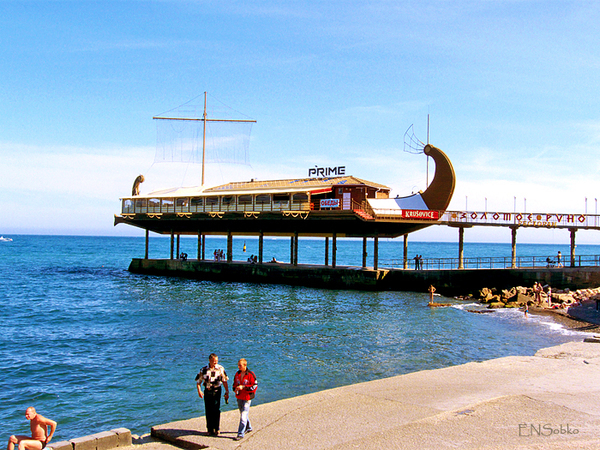 Here is where Yalta originated, witness is the very name Polikur (“Paleokhor”), which in Greek language means «Old Place». 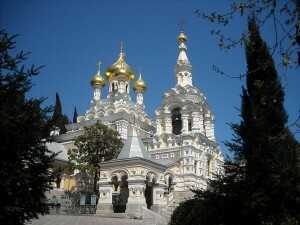 The Hill formerly bore the name of St. John. 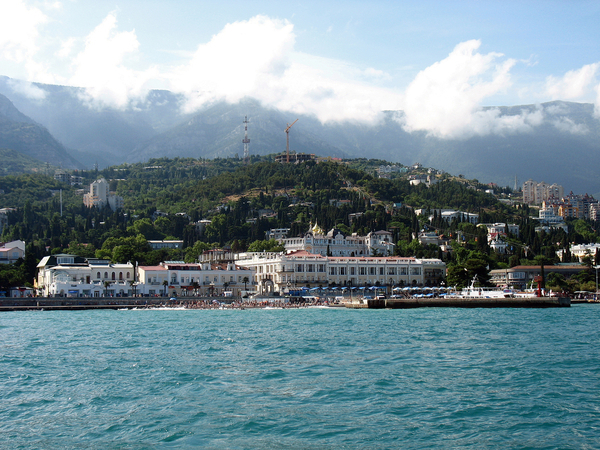 Yalta is the only port on the Crimea’s southern shore which can safely shelter ships in a storm. 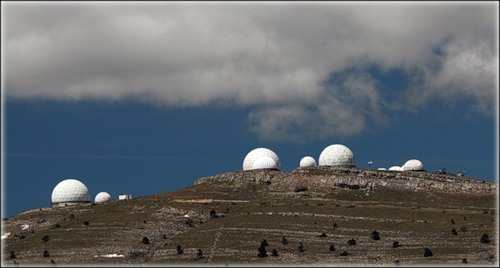 The talented engineer A.Bertier — Delagarde supervised the construction of the Yalta mole in 1889-1892. 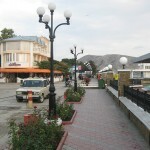 Near the port there is the Yuzhnaya Hotel (“Southern Hotel”) which stands on Roosevelt Street. 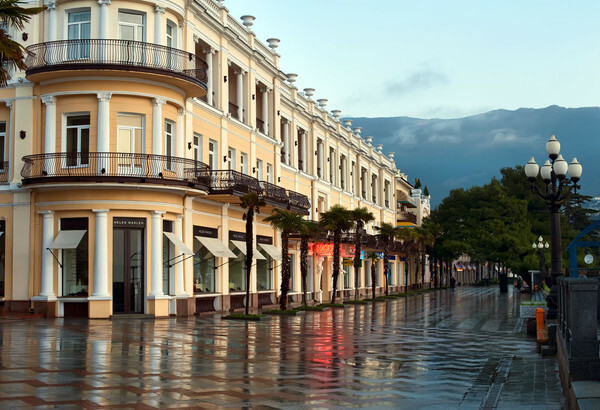 It is the oldest street in the city and was given its present name in honour of the outstanding statesman US President Franklin Roosevelt (1882-1945), who visited Yalta in February 1945. 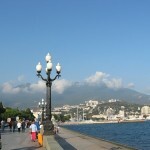 Yalta‘s main street is the Embankment. 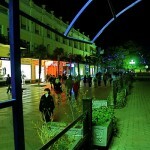 It is favorite avenue of holiday makers for their even strolls. 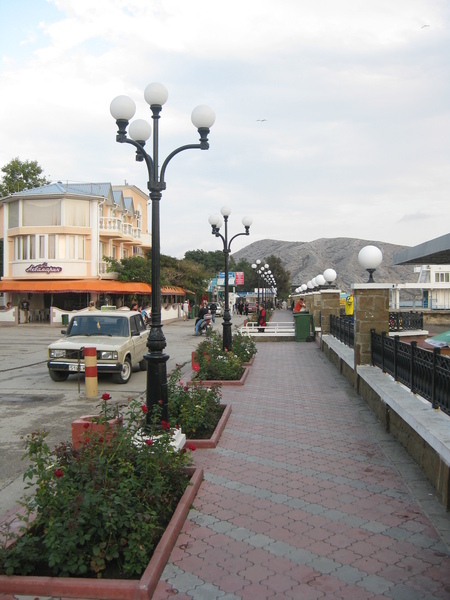 The Embankment te lined with shops, cafes, and restaurants. 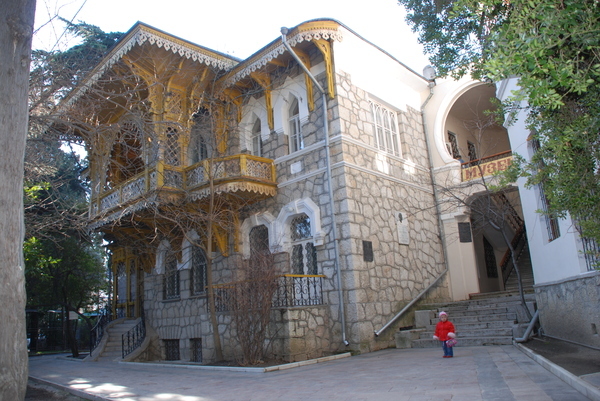 There is the oldest Tavrida Hotel, that was built in 1875. 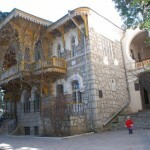 The great Russian poet Nickolai Nekrasov lived in Tavrida Hotel in room 68. 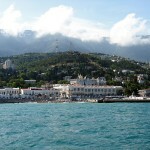 He wrote the part of his long poem «Who Can Be Happy in Russia?» in Yalta. 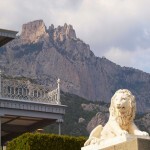 If you cross the Hotel Tavrida’s courtyard, you will find yourself next to the boarding platform for the cable-car line which leads to the top of Darsan Hill. There is the Mound of Glory, erected in memory of the fallen during the Civil and Great Patriotic Wars. Ahead lies the second half of the Embankment. 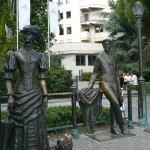 The Municipal Park, which merges with it, was established in the 1880s. There is the monument to the great Russian writer Anton Chekhov near Municipal Drama Theatre. 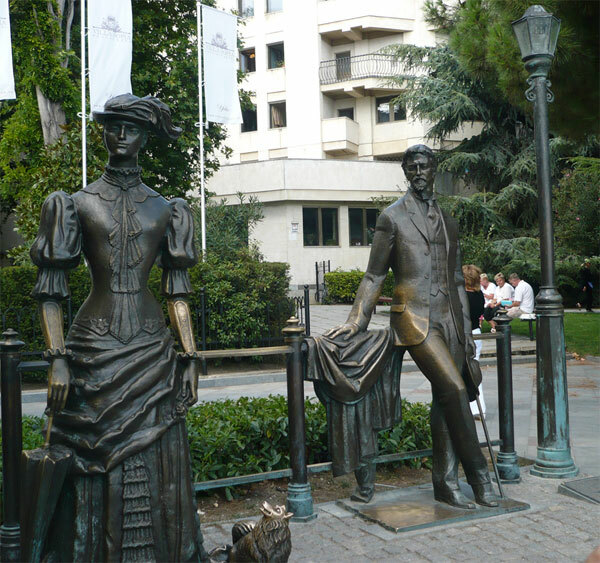 In the house across the theatre lived the famous Ukrainian poetess Lesia Ukrayinka (1871-1913) A bronze statue has been set up in her memory right in front of the house. 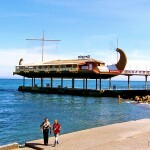 The final stop of the Embankment tour is the Oreanda hotel. 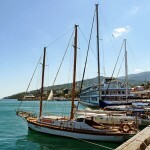 Across from the hotel is a small public garden where the schooner Espanolahas been mounted. 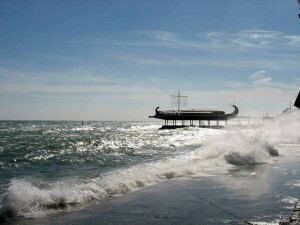 It has been built specially for the film about the sea-advantures.